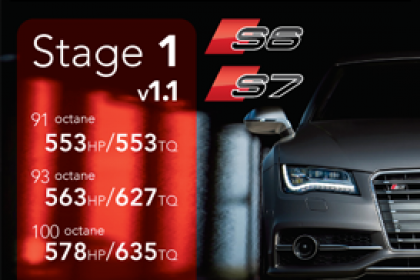 APR is pleased to present the ultimate engine control unit (ECU) upgrade for the 4.0 TFSI V8. APR’s ECU upgrade is available in octane-specific variations, including and is conveniently flashed to the vehicle’s factory ECU through the OBD-II port without any physical modification to the factory ECU. APR’s EMCS functionality puts the control of the engine’s operation at your fingertips and allows for additional features and options to be installed to the OEM ECU. The ECU’s MED 17 engine management system is responsible for proper operation of the engine during constantly changing environmental and load conditions. With built in compensational data for environmental variables and varying load conditions, the factory ECU is far more complex and intelligent than units found in other vehicle makes and marques. APR’s Calibration Engineers spent months calibrating the engine management system, including many hours of chassis dyno development. With a thorough understanding of the ECU’s torque structure, APR’s Calibration Engineers properly increased engine load to produce more power and torque across the entire power band. APR’s ECU Upgrade increases boost pressure, optimizes ignition timing, cam timing, lambda and more to produce higher output! 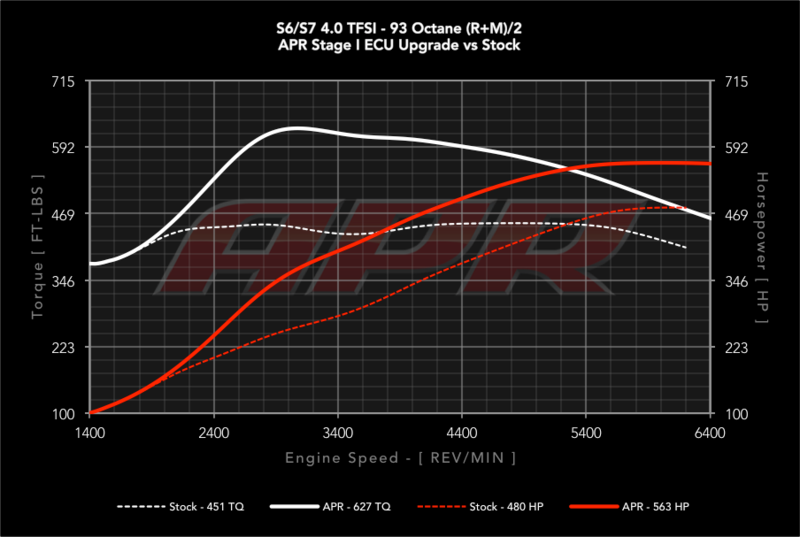 The APR Stage I ECU Upgrade gives you higher peak numbers of 563 HP/627 FT-LBS on 93 (R+M)/2 octane and up to 578 HP/635 FT-LBS on 100 (R+M)/2 octane race fuel! As much as 138 HP and 198 FT-LBS of torque are available through the power band! – APR recommends and tuned with Sunoco GT 260 for 100 AKI mode and Sunoco GT 260 Plus for 104 AKI mode. Never use lower octane than specified by the mode. 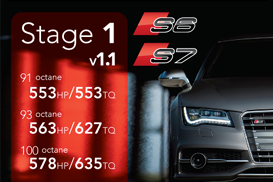 – Max increases are based on APR’s actual measured stock values and not those reported by Audi. | RON = ROW Fuel Grades | AKI = North American (RON+MON)/2 Fuel Grades. – Reported wheel figures measured on APR’s in house Dynapack Dynamometer with a US Spec 2013 S7 S-Tronic, using SAEJ1349 correction and an average of multiple runs. Crank figures are estimated based on the measured wheel figures. 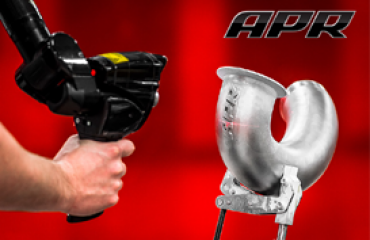 Results may vary depending upon environmental conditions, vehicle, transmission, vehicle health, operating conditions, temperatures, fuel grade, dyno type, dyno setup, other variables and other modifications. Data collected with version 1.0 at the same location via a Racelogic P-Box and at an IHRA Certified Drag Strip with launch control, ESP/ASR off, Dynamic mode and Sport mode. May not be comparable to data collected in other locations. – Program switching may not be ablable for all vehicles. – Pricing applicable to the USA only. 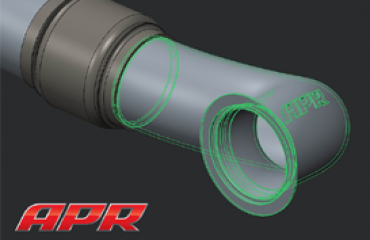 If outside of the USA, please contact an APR Dealer and Importer for pricing. – Please note vehicle manufacturers issue many ECU part numbers and revisions throughout their vehicle lineup. As such, some ECUs may be temporarily unavailable as new parts and/or revisions are released. If the vehicle’s ECU part number and revision is known, availability can be checked at any APR Dealer. © 2000 - Present, Next Level Tuning Inc., All Rights Reserved. Address: Next Level Tuning Inc, 305 Beaver St. Greensburg PA, 15601. All prices are in USD and are applicable to the United States of America only.